Total knee arthroplasty is used as the treatment plan for patients with end-stage osteoarthrosis associated with severely affected function. Although TKA has been used for many years, some patients have reported overall dissatisfaction regarding the outcome. This may be due to the complexity of the joint design. In recent years, the concept of single-radius knee prosthetics is gaining more popularity as many studies have discussed biomechanical and clinical benefits of such design compared to traditionally used multi-radius implants. In this study, we report the outcome of 78 patients who were treated by TKA utilizing a relatively new single-radius implant, Unity. Results showed that all subjects reported good outcomes as expressed by significant improvement in their Knee Injury and Osteoarthritis Outcome Scores at 1-year post-operative. The symptom, pain, and ADL subscores demonstrated significant improvement in patients with scores twice the pre-operative value, while the average improvement in sport and quality of life subscores showed even greater improvement with scores three times the pre-operative value. Total Knee arthroplasty (TKA) is the ultimate treatment to alleviate the symptoms of the knee osteoarthritis (OA) after alternative treatments are exhausted. TKA is used to relieve the pain and to restore normal function of the knee. However, different implants and surgical approaches have shown inconsistent results with achieving normal function of the knee. The limitations in performing normal activities such as limited range of motion, less stability of the knee compared to normal knee, and the loss of proprioception may be factors affecting the outcome of the surgery. Therefore, design of knee implants has been the center of attention for TKA. While most common knee designs on the market are based on multiple centers of rotation, a new concept was proposed in 1993 based on a single-radius design to achieve more natural knee kinematics . Since then, many studies have demonstrated that during a flexion-extension activity, knee rotation follows a single radius curvature path over the femoral condyles by rotating around a fixed transepicondylar axis [2-6]. A single-radius design concept provides a longer extensor moment arm and retains the movement isometry throughout the full range of motion [7,8]. Therefore, single radius design knees are expected to retain more natural kinematics of movement during daily activities [9-11]. Previous studies have reported superior functional outcomes in patients who received single-radius knee implants. These outcomes include a better rehabilitation process, faster recovery and return- to-work-time, and significant reduction in knee pain. In theory, the aforementioned benefits would result in superior patient satisfaction level [9-11]. The Unity Total Knee System, like other single radius knee designs, has been designed to reduce the muscular activities of the knee extensors and to provide better ligament stability, which may ultimately result in reduced and more normal patellar load [12,13]. This implant maintains the medial joint axis throughout full range of motion. This design concept helps with isometry of MCL loading and movement after TKA . In a very recent study by Paszicsnyek, clinical outcomes of 89 patients treated by TKA using Unity knee implants with a posterior stabilizing approach (PS) were evaluated . The authors indicated positive survivorship, clinical and performance improvements, and no radiographic failure. The Posterior cruciate ligament (PCL) is known to stabilize the knee during flexion, particularly by constraining the femoral and tibia relative translation, and in high flexion by constraining the mediolateral translation of tibia. Therefore, it has been suggested that PCL preservation might retain the natural knee movement after TKA . In this study we aimed to add more clinical data to the body of the literature and to analyze the functional improvements in patients with Unity Knee TKA by using a cruciate retaining (CR) method. 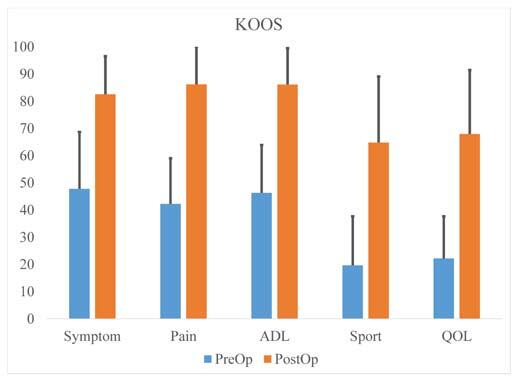 We hypothesized that the functional outcomes measured by the Knee Injury and Osteoarthritis Outcome Score (KOOS) evaluation would demonstrate significant improvement in patients during the postoperative period. In addition, we aimed to report revision and negative cases and to discuss the potential effects of patients’ demographics on the outcome of TKA using the Unity TKA system. A retrospective review of preoperative and postoperative data of 80 individuals (34 males/46 females) who received total knee arthroplasty treatment was conducted. All patients received the Unity single radius Total Knee System (Corin Ltd., Cirencester, UK). The demographics of patients are shown in Table 1. However, as the majority of the patients (total 78) were treated by using a cruciate retaining method (32 males/46 females) the demographics of the patients used in the study is reported in Table 2. The data were collected from January 2013 to May 2015 at a single institution from cases performed by one of the authors. The data were collected by using an online web-based data-entry software from an IRB-approved joint registry. Informed consent was obtained from all participants in the study prior to data collection. Table 1- Demographics of CR patients in the study. A standard medial parapatellar approach was performed and all patients received a cemented single-radius cruciate-retaining Unity™ Total Knee System (Corin Ltd., Cirencester, UK). The sequence of surgical steps included a distal cut using an intramedullary reference guide followed by the proximal tibial cut. The slope and the varus/valgus angle was adjusted to the natural tibial plateaus of the patient avoid to exceed the accepted range of +/- 3 degrees. The extension gap was then balanced by soft tissue release. Femoral rotation was adjusted using the EquiBalanceTM in 90 degrees of flexion as shown in Figure 1. Figure 1. Adjustment of femoral rotation by using EquiBalance™. The knee cap was measured pre-cut and was resurfaced to reestablish pre-operative thickness. Once adequate hemostasis was obtained, the joint was copiously irrigated followed by cementing of the tibia, patella and femoral component. All excess cement was removed and followed by irrigation and closure in layers. 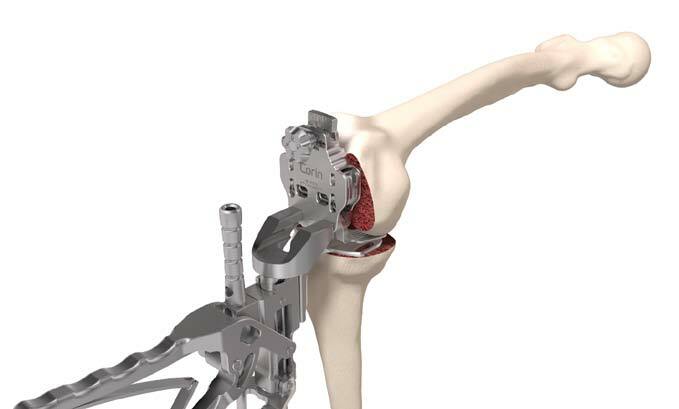 The design of this total knee system utilizes a single radius implant geometry with an instrument platform which aims to maintain the medial joint-line throughout range of motion in order to optimize MCL isometry post TKA. In addition, the patellofemoral track in this design has a lower profile and an early lateralized anatomic patellar track compared with traditional knee systems, which reduces constraint on the patellofemoral mechanism and therefore minimizes anterior knee pain . The goal of this TKR system is to maintain balance throughout the range of motion, resulting in improved patient outcomes. The underlying causes for a primary total knee arthroplasty were end-stage osteoarthritis (n=76; 97.43%), posttraumatic arthritis (n=1; 1.23%) or a failed implant (n=1; 1.13%). Each patient completed at least one postoperative questionnaire to calculate the clinical outcomes represented by KOOS. The KOOS represents five subscores which were compared for each group. These postoperative data were collected either during the follow-up clinic visits or by using an online questionnaire. Patients in this study received an implant by Corin (Unity Knee, Corin, UK). The five subscores were Symptom, Pain, ADL, Sport, and Quality of Life (QOL). A postoperative radiograph was used in each case to check for fixation, component failure or malalignment, and progressive radiolucency around the implant. A Multivariate mixed model was utilized to compare the postoperative outcome of each implant. A significance level of .05 was assumed in this study. Body Mass Index (BMI) and age (as covariates) and gender (as between group factor) were utilized in the model to evaluate potential changes in functional outcome in response to changes in these factors. All statistical analyses were conducted using SPSS 23.0.0 (SPSS Inc., Chicago, Illinois, USA). All patients in the study completed at least one postoperative questionnaire to allow the calculation of KOOS for functional outcome measurement. The results of the overall multivariate mixed model indicated that the overall functional outcomes significantly improved between the pre-operative and post-operative survey with (F(5,73)=77.34, p<0.001)). This improvement in functional outcome was significant for all subscores, as summarized in Table 2. The post-surgery subscores were significantly higher in all patients demonstrating excellent clinical performance improvement. Table 3 – KOOS subscores assessed during preoperative and postoperative surveys. Figure 2 - The KOOS scores comparison between Preoperative and Postoperative period. Table 4 - KOOS subscores for categorized based on gender. In addition, the results of the mixed model that was conducted to evaluate the differences between demographics data indicated that patients’ demographics were not significant predictors of the functional outcome. For BMI (F(5,70) = 1.06, p =0.39) and the KOOS subscores are summarized in Table 4, for age F(5,70)= 0.565, p=0.658 and for gender effects F(5,70) = 2.124 p=0.073. Although TKA has been utilized as the ultimate treatment method for end-stage osteoarthritis and despite high survivorship of this procedure, for many patients it has not always resulted in satisfactory functional outcomes. Many studies indicated dissatisfaction of up to 20% of patients from the surgery [17-20] attributed mainly to the significant changes in knee kinematics that may result in abnormal gait and balance experience . It has been proposed that prosthesis design is the primary factor altering the function of the knee following TKA [7,18,22-25]. As a result, implant manufacturers have focused on developing prosthetic knee devices that simulate the natural knee kinematics. Traditionally, knee prosthetics with multi-radius design over the femoral component have been used; however, recent development of single-radius knee implants have shown improvements in both mechanical and clinical functions of the knee after TKA [8,13,14,18,26-30]. In these implants, the biomechanical functions are improved by lengthening the extensor moment arm, providing longer distal and posterior axis, and by maintaining the isometry of the rotation and force distribution throughout the range of motion resulting in less patellar load [7,8, 31,32]. The mechanical improvements of the prosthetic knee after TKA therefore may contribute to better functional outcomes, decreased knee pain, a shorter rehabilitation period, faster recovery and reduction in the time to return to work [18,29,30,33]. We report on the short term clinical outcome of a newly designed and recently released to the market single-radius implant, Unity Total Knee System. Our results indicated significant improvements in all clinical outcomes of the first 78 CR patients in a single surgeon series. Our results are similar to those recently reported by Paszicsnyek indicating good survivorship and positive clinical outcome of this implant . In that study, the author investigated the functional outcome of the TKA by using Unity and indicated significant improvement in the outcomes measured by American Knee Society Score, Oxford Knee score and radiographic measurements. However, the authors had not reported KOOS subscores in that study. Molt et. al have reported the clinical outcomes measured by KOOS in patients who received a traditional single radius implant, Triathlon TKA (Stryker, Mahwah, New Jersey, USA). In our study the average follow-up range was 361±228 days. Therefore, we descriptively compared our results with those 1-year results reported by Molt et. al., as summarized and reproduced in Table 4 and depicted in Figure 3. The scores in the current study are comparatively higher than those of patients who were treated by Triathlon CR in the earlier study . Further research including a randomized controlled study is needed to compare the clinical outcomes of these single-radius implants. Table 5 - KOOS subscores reported by Molt et. al versus those reported in the current study. 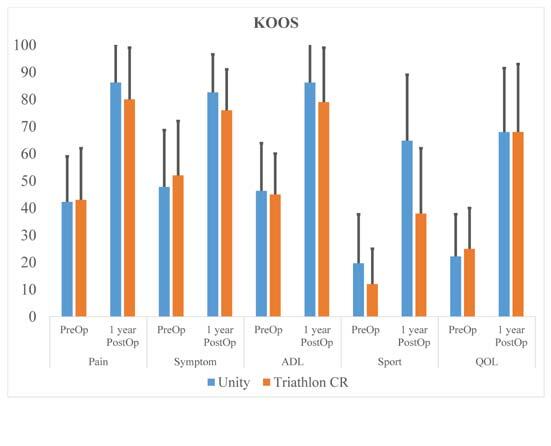 Figure 3 – KOOS subscores reported by Molt et all for patients treated by two types of single-radius Knee (Triathlon CR) compared to the KOOS subscores reported in the current study for patients receiving Unity. There are several limitations to the current study. First, the study was conducted retrospectively on single design implants. The aim of the study was to evaluate the improvement in patients’ functional scores; however, future studies may be needed to further evaluate the outcome of the Unity implant compared to other traditionally available single-radius prosthetics prospectively. The surgeries were conducted by one surgeon; thus, this might limit the scope and generalizability of the outcome. Future studies may be designed to use multiple investigational centers. In addition, we did not analyze the range of motion or conduct other biomechanical assessments of the performance, which should be considered for future studies; however, clinical assessments based upon patient- reported outcomes, as assessed by the application of KOOS, can be a reliable indicator of post-operative improvement and potentially overall patient satisfaction. In this study we reported the short term clinical outcome of a new single-radius knee prosthetic design. Patients in the study demonstrated excellent improvement in functional outcome indicating the short term success of this implant design. Future studies and longer-term data collection is needed to further generalize the outcome of this study. Paszicsnyek, T. (2015). Early Experience With a Modern Generation Knee System: Average 2 Years’ Follow-Up. Reconstructive Review, 5(4), 23–28. Mihalko, W. M., & Krackow, K. a. (1999). Posterior cruciate ligament effects on the flexion space in total knee arthroplasty. Clinical Orthopaedics and Related Research, (360), 243–250.